NASA scientists have definitively detected the chemical acrylonitrile in the atmosphere of Saturn's moon Titan, a place that has long intrigued scientists investigating the chemical precursors of life. Astronomers have used an Australian radio telescope to observe molecular signatures from stars, gas and dust in our galaxy, which could lead to the detection of complex molecules that are precursors to life. We report the first detection and high angular resolution (1.8" × 1.1") imaging of acetic acid (CH3COOH) and gGg′--ethylene glycol (gGg′(CH2OH)2) towards the Orion Kleinmann--Low nebula. There is a long-standing debate regarding the origin of the terrestrial planets' water as well as the hydrated C-type asteroids. Here we show that the inner Solar System's water is a simple byproduct of the giant planets' formation. We present experimental constraints on the insertion of oxygen atoms into methane to form methanol in astrophysical ice analogs. 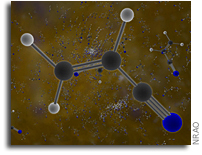 We report the detection of the carbon-chain radical HC5O for the first time in the interstellar medium toward the dark cloud TMC-1 using the 100 m Green Bank Telescope. The astronomical observation of isopropyl cyanide further stresses the link between the chemical composition of the ISM and molecular composition of the meteorites in which there is a dominance of branched chain amino acids as compared to the straight.